With this first month of the season wrapping up on Thursday, I figure it would be a good time to revisit one of my favorite topics of NHL attendance. Let me state this up front, the purpose of writing this up is not to determine who could be a relocate target. Anyone that has been here and has followed me on twitter and the facebook know I’ve never advocated for relocating the Coyotes to Seattle. I am a fan of the game and believe it can survive anywhere. The analysis, commentary or any other narrative below is not intended to slam any team, owners and most importantly the fans. It is simply analysis on data that is reported for every game. 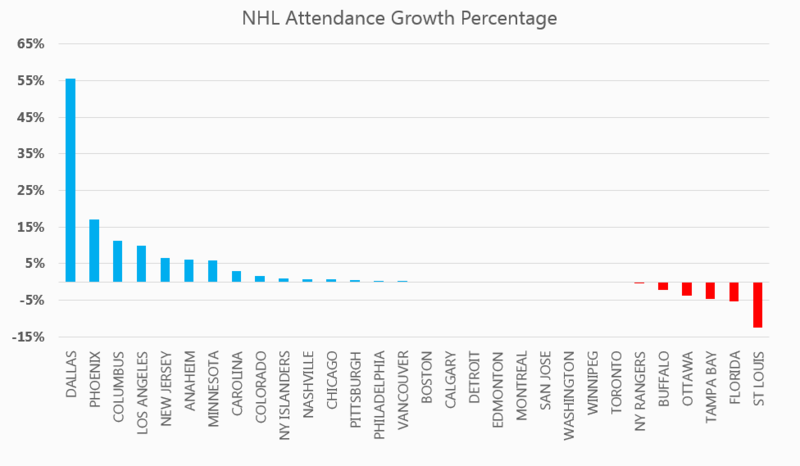 Calling out Phoenix, St. Louis or Florida is only because they have some of the most volatile attendance and therefore provide more interesting data to review. 11 teams have seen increase in attendance from October 2011 compared to 4 teams with a drop. Average Attendance is up 2% against October attendance of 2011. 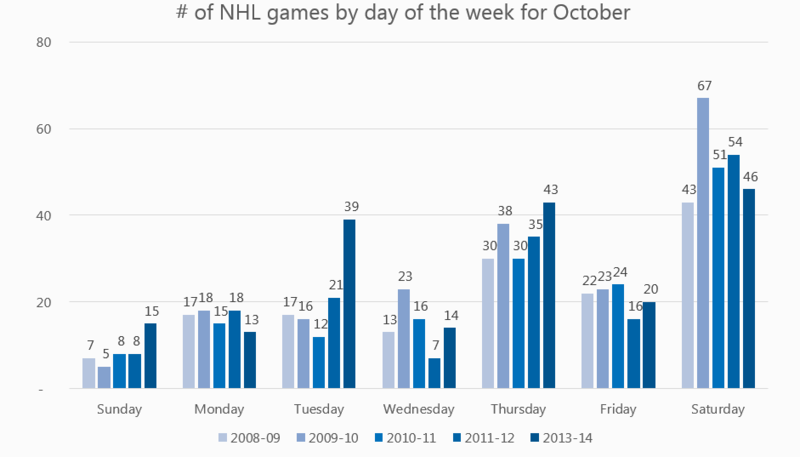 # of Saturday games in October was down from 54 games in 2011-12 season to 46 Saturday games this season. This is important because teams that do not sellout every game tend to draw 5 to 10% higher with a Saturday game. The reason for the lower # of Saturday games is because 2011 had five Saturdays in the month versus four in 2013. Dallas, Phoenix, Columbus & Los Angeles are all up double digits % wise compared to October 2011. Dallas is up a big 56% thanks to stable ownership. October 2011 was a time period where the team was going through the bankruptcy process. Ottawa, Tampa Bay, Florida & St. Louis are the only franchises down compared to October 2011. Ottawa & Tampa Bay are still averaging over 18,000 a night which is better than half the league. 16 of 30 teams have sold out every game through October. Here are a couple other cuts at the data that tell some interesting stories. 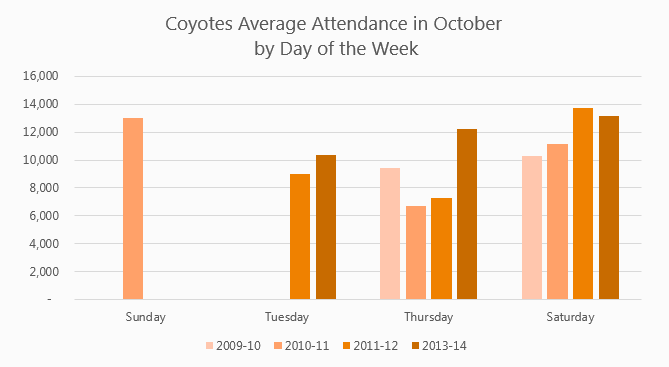 Coyotes are out performing October 2011 on Tuesday and Thursdays but lagging on Saturdays. You can chalk that up to the matchups, Edmonton games draw poorly in Phoenix. 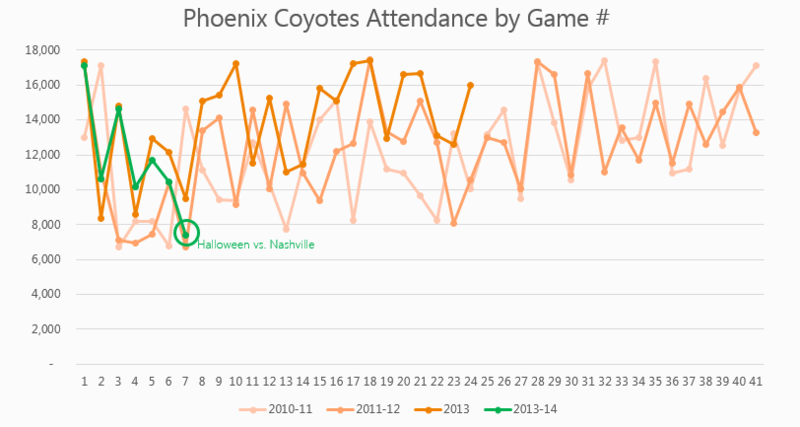 Coyotes also had a tough scheduled game with Nashville on Halloween where they only drew 7,400 people which was the lowest attended game for the year. That was the only game under 10,000 compared to 4 out of the first 7 games of 2011-12 that were under 10,000. All in all, the Phoenix attendance story should be viewed as very positive. Florida on the other hand is really performing poorly. In spite of some favorable opponents (for Attendance sake) they are really having a tough time drawing fans. Below is the table that shows how Florida traditionally draws against the opponents they faced in October. With the exception of Pittsburgh, all games drew less than they have in either of the last 2 years. One thing that I should point out is that Florida tends to draw the best in December and January so the table above might have several December and January games to compare. As a whole, the NHL had a great October and it will be interesting to look if the momentum continues and the impacts to the new division alignment and scheduling. Let me know if you have any questions or thoughts. There is a lot of data to comb through and could bore people to death with my analysis so thought I would stop before I do. The Blues’ attendance will rebound now that baseball season is over. Seven home games in the midst of a Cardinals’ World Series run vs the chance to watch/go to a playoff game…that’s an easy decision for most St. Louis sports fans. Throw some Rams fans in the mix (there are a curious few), and hockey is always going to lose that ticket money and those eyeballs. The Saturday Edmonton game was also a NOON start. Not as likely to attract the Saturday NIGHT sports crowd. These are not actual attendance numbers. They are tickets distributed. So … the Panthers were not getting 18k a game in January. There were an avg of 18k tix distributed. That includes tix sold and full or discounted prices and those given away for free. It also doesn’t count the seats left empty. They need to move, as do the Coyotes and Predators.